Figure A78. Sao Francisco anomaly, interpreted as the Sao Francisco slab, with (horizontal) [vertical] cross sections through (A)[D] the UUP07 p-wave) and (B)[D] the combined SL2013 and S40RTS s-wave models at 2510 km; C) the location of the modern geological record that we interpret to have formed during the subduction of the slab. 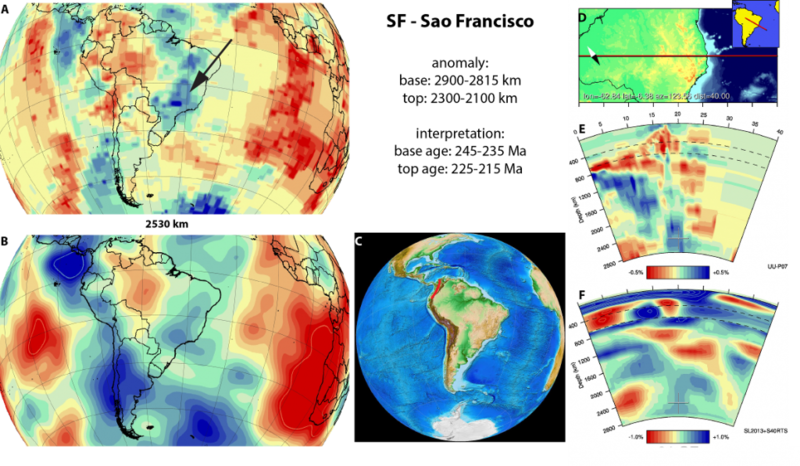 The Sao Francisco anomaly (Figure A78) is located below eastern South America, within the deepest mantle and resting on the core-mantle boundary. It is NE-SW trending at the core-mantle-boundary and changes to N-S trending at shallower levels. It is disconnected from and lies eastward of the Brasilia slab. At the CMB, it connects northward with the Atlantis slab suggesting a possible common origin. As we interpreted the Atlantis slab to result from Triassic Panthalassa Ocean subduction along southwestern Laurentia, we infer the Sao Francisco slab to have formed at the northwestern Gondwana (South American) continental margin. At this location, which would fit the NE-SW slab trend, Triassic metamorphism (243-225 Ma) affected granites, basalts and sedimentary rocks in the Tahamí Terrane, interpreted to have taken place in an Andean-type orogeny on the western side of Pangea as part of an orogenic belt (Restrepo et al., 2011). We connect this record to the subduction of the Sao Francisco slab and use it to date the Sao Francisco slab.